We are very proud to have sold our first pair of men’s boardshorts that we handcrafted at our factory in Costa Mesa, California. Most noteworthy, there are only a couple of surfwear companies that sew the boardshorts that they sell to water board sports enthusiasts. Therefore it pleases us to be among this select group of surf brands! In May of this year we bought our triple needle sewing machine. This machine allows us to triple stitch the seams of our mens board short. Furthermore triple stitching in an important benefit for well-crafted, high quality, durable Men’s boardshorts. Now we buy our raw materials, make our patterns and sew our California made board shorts in house. Additionally we trim, press and tag our board shorts. We’ve started out offering two surf trunks. 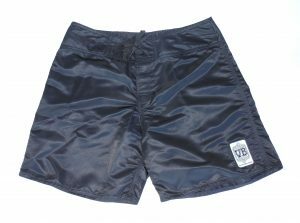 The first pair, pictured below, is 18 inches in length, dark navy, 100% polyester micro fiber with a side pocket and Velcro flap. Also a white nylon tie cord and a 1.5″ Velcro fly. The name of these mens boardshorts is ‘Round About Midnight. We got this name from a Miles Davis album released in the 1950s. The second pair of our men’s boardshorts, pictured below, is also 18 inches in length. The color is black, 100% nylon with a back pocket and Velcro flap. As well as solid black grommets, black nylon tie cord and a 1.5″ Velcro fly. Wild Records is the name of these trunks. We took this name from a record label based in Los Angeles, California. This independent label specializes Rockabilly, Rock and Roll & Blues.